Most investors are no doubt familiar with the standard disclaimer “Past performance is not indicative of future results.” We know from working closely with individual investors for the past 20 years, however, that this compliance truism tends to stay in the fine print, both on paper and in investors’ minds, when they make decisions on the basis of real-time market dynamics. Even if investors purport to buy into the logic of the “random walk” argument about security prices, in practice they tend to extrapolate recent history into the future (termed recency bias in behavioral finance) when making portfolio decisions — for example, believing that if stock prices have gone up recently, they will continue on that upward trajectory. When the desire to chase returns goes unchecked, investors often engage in aggressive trading. But do they end up better off for their efforts? To find out, the Gerstein Fisher Research Center examined the average investor’s actual returns in various asset classes versus the average performance of each asset class over the 15 years from 1 January 1996 to 31 December 2010. The universe of data is from 25,000 mutual funds in Morningstar’s database and is free of survivorship bias. The results are revealing and confirm our hypothesis that investors’ own emotions can be their worst enemy. 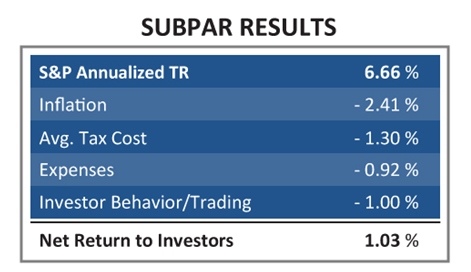 Over the 15-year period we examined, the S&P 500 Index generated a 6.66% annualized total return, whereas the average investor in mutual funds tracking the S&P 500 over the same period saw his or her portfolio’s value grow by only 1.03 percentage points in inflation-adjusted terms. How is this possible? As we can see in the table, the largest bite out of investors’ returns came from inflation (2.41%), as measured by the annualized monthly U.S. Consumer Price Index data (from the Bureau of Labor Statistics). We estimated that investors surrendered an average of 1.30% to taxes, a calculation for which we assumed a 35% income tax and a 15% capital gains tax on annual profits across all funds. We calculated the annualized expense ratio of 0.92% as a weighted average by using fund assets at the beginning of each year. Although these key detractors from investors’ bottom-line performance are not entirely surprising, it is interesting to note the extent to which the outcome is also driven by a factor over which investors, in principle, have complete control: their own behavior. Indeed, fully1% of the investor’s underperformance relative to the asset class can be attributed to trading activity. Our research reveals this to be a strategy of essentially replacing recent underperformers with recent outperformers — in other words, attempting to time the market and not doing a very good job of it. Investors chase returns and harm themselves by doing so. They chase returns by allocating more to funds that perform well in a mistaken belief that past performance will persist. On the basis of our research, it seems that simply by doing the opposite of what their instincts tell them to do, investors could earn — rather than lose — an extra 100 bps on an annualized basis. Particularly when compounded over time, that’s real money.